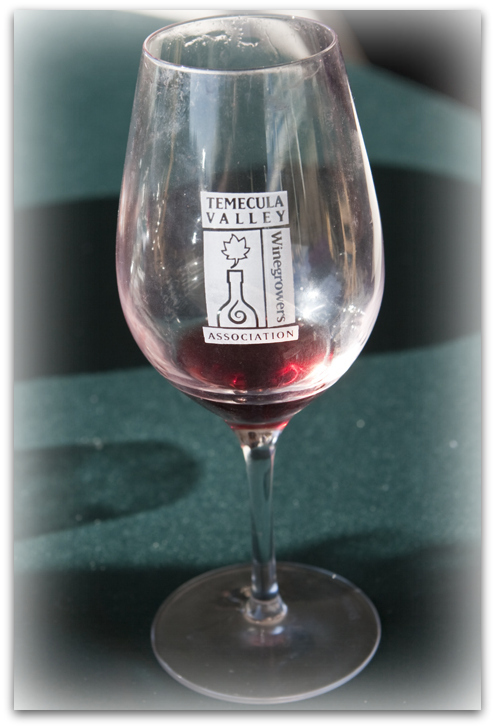 When I visited South Coast Winery last week, they had just won another two medals the night before at the Southern California Temecula Valley Wine Competition, bringing their total for the year to well over three hundred. 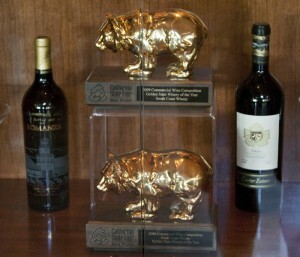 They have also just won the prestigious “Golden State Winery of the Year” award for the second consecutive year. Pretty impressive considering South Coast only opened its doors in 2003. 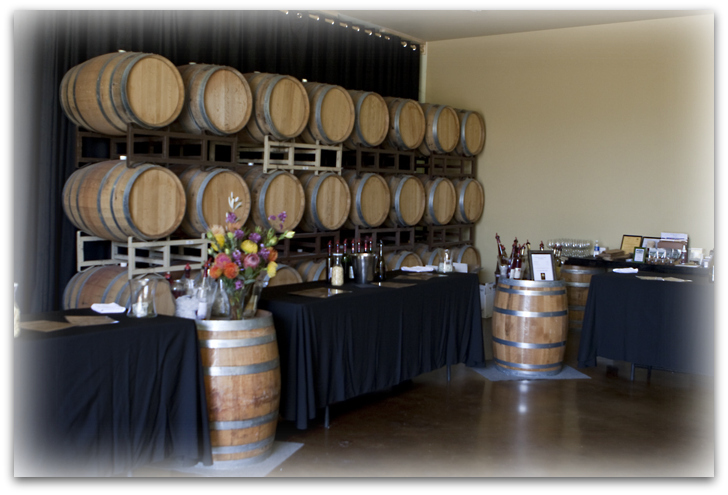 I met with master winemaker Jon McPherson in his office inside the barrel room. Jon is a native Texan. His dad founded the Llano Estacado Winery in 1976 in Lubbock, so Jon grew up in the vineyards. His dad was one of the first in the nation to hire an Australian winemaker, and Jon learned a lot from him and the subsequent winemaker. His brother studied at UC Davis and returned as Llano’s winemaker. In 1985 Jon decided he wanted to start making wine, in particular sparkling wine. 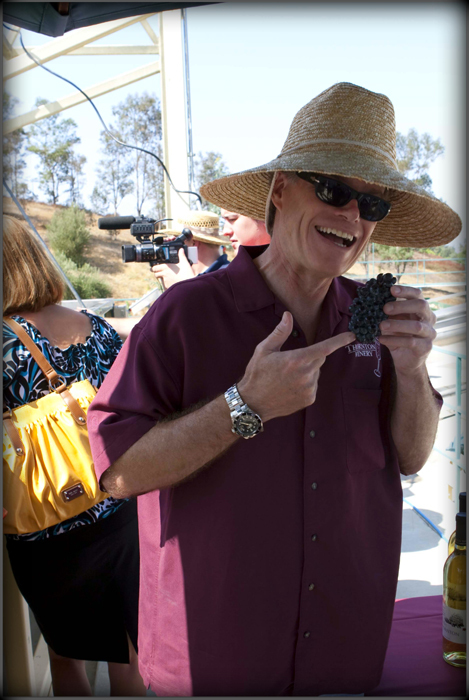 Armed with degrees in food science and chemistry, he came to the Temecula Valley and started worked at Culbertson Winery, which would later become Thornton Winery. 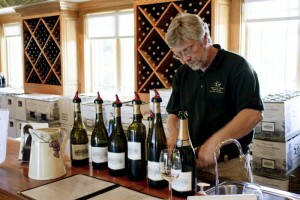 At Culbertson he was making sparkling wines using the Methode Champenoise. He learned about a different way of producing sparkling wines called Charmat, and it’s how he produces his sparkling wines today. Jon joined South Coast when the winery opened its doors in May, 2003, bringing winemaker Javier Flores with him, because each man possesses a different skill set, and, he adds, it’s more than a one man job. 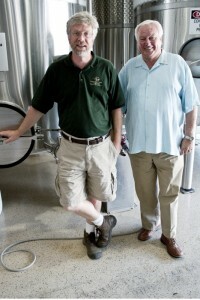 Winery owner Jim Carter joined us and it’s easy to see how these two men complement each other. Jim’s goal is to provide Jon with the best grapes so the he can make the best wine, not only in the county, but in the state. 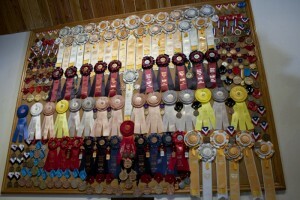 Winning the Golden Bear Award two consecutive years might tend to make some folks want to rest on their laurels. Jim Carter and Jon McPherson both strive to find ways to do even better. Jon told me he’s his own worst critic and that he is always able to find flaws in his wines which spurs him on to make even better wines. They work together and constantly strive to produce as good a product as they can. Both men spoke to me of passion and both exude it. Jim believes you can’t produce good wine if you’re not passionate about it, and believes those that open wineries just to make money have got the wrong idea. In creating South Coast Winery, Jim’s goal was to offer his guests the true wine country experience: a villa in the vineyards, a working winery, fine dining, a spa and a venue for live entertainment. But, as Carter says “The real heart of what we do is wine.” South Coast’s facility is more than 100,00 square feet under roof, but he has grander plans for the future. His goal is to open Carter Estate Winery, a high end sparkling wine and estate wine complex that when completed would become California’s largest winery resort at 535,000 square feet. He is currently waiting on County approval. Jon told me it’s easier to name the grapes they don’t grow than the ones that they do. More than 90% of their wines are estate grown. Jon took me to the tasting room. 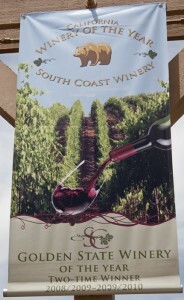 South Coast features 38 wines on its tasting list. We sampled 21 of them. With that many wines, we were definitely making good use of the spit bucket. At one point, a woman saw me spit and came over and said “oh, you really didn’t like that one, did you?” I assured her I liked it just fine! The ones that stood out for me were the ’07 Sans Chene Chardonnay, 100% stainless fermented, with a lovely nose and refreshing green apple finish. The ’07 Reserve Chardonnay is barreled in oak, but is not overpowered by it. I enjoyed it, finding notes of vanilla and tropical fruit. The ’08 GVR (Grenache Blanc, Viognier and Roussane) has pears on the nose and a silky finish. I love Gewurtztraminers that run on the dry side and was very impressed with South Coast’s ’08. The Sparkling Gewurtztraminer is crisp with 2.5% residual sugar. 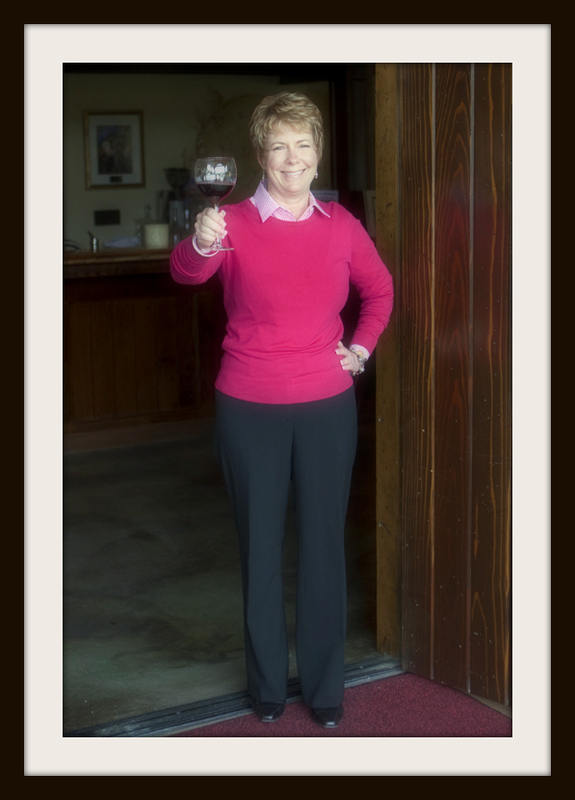 The Ruby Cuvee is a sparkling Syrah with a deep ruby color and distinct Syrah characteristics. The whites and sparkling wines were my favorites of the day, but two of the reds shone for me. The ’05 Sangiovese was well rounded with a soft finish. The ’05 Wild HorsePeak Cabernet Sauvignon is aged in a combination of new French, American and European oaks for 18 months. It’s a classic cab and was very pleasing to my palate. 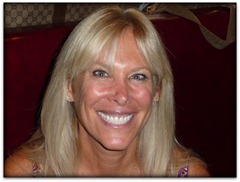 Crystal Magon, South Coast’s Director of Sales and Marketing, concluded my tour by taking me to one of the villas. 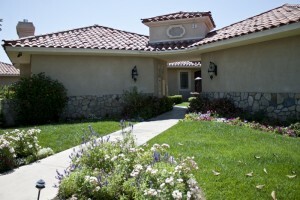 There are 76 villas altogether, each one with fireplaces and patios that open to Viognier vineyards. During the harvest, guests are invited to help pick the grapes. Crystal explained to me that Jim Carter is involved in every aspect of the operation, even down to the design of the mattresses. He went through seven prototypes before he was satisfied. She says her guests call them “beyond heavenly”. 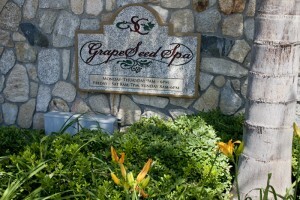 Our next stop was at the 15,000 square foot Grapeseed Spa. 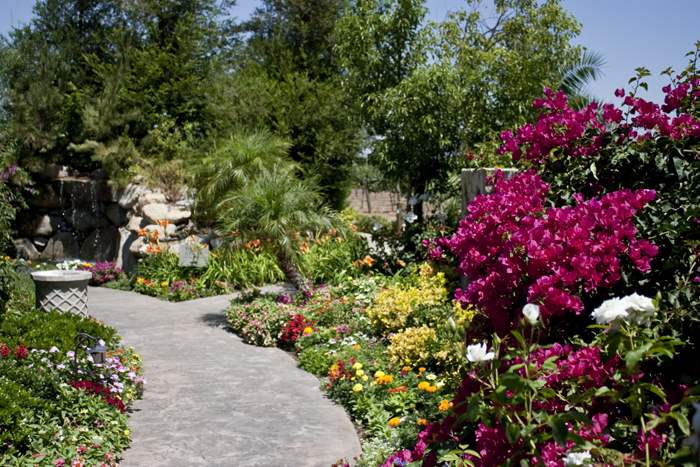 You walk past brilliant bougainvillea and tropical flowers as you enter the spa. Numerous services are available, including Thai massage as well as grape seed and champagne facials with Pinot Noir yeast. Downstairs there’s a fitness facility. 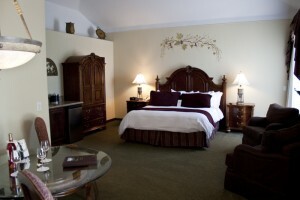 A pool, separate locker facilities for men and women and a well stocked gift shop are all at your disposal. South Coast also has the Vineyard Rose Restaurant serving breakfast, lunch and dinner with beers on tap and South Coast wines. The 7,200 square foot conference room seats 700. I returned this morning to watch as they bottled the “Lot 1” Cabernet Sauvignon. If you’ve never seen a bottling before, it’s a fascinating process. 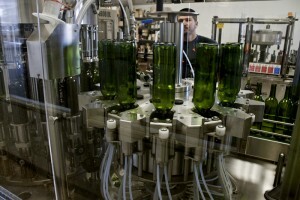 Cases of empty wine bottles are placed at the beginning of the line. They proceed single file where they are then rinsed, filled, corked and placed into cases. 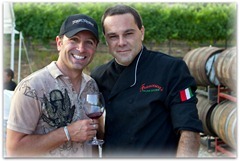 Winemaker Javier “Javy” Flores had returned from vacation and was on hand with Jon McPherson. Both men are affable and made me feel most welcome in their home. 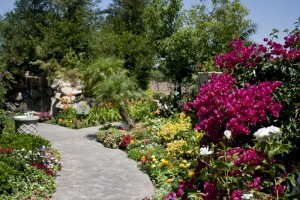 A trip to the Temecula Wine Country would be incomplete without a stop at South Coast Winery. If possible, schedule a visit during the week when things are a bit quieter. When you win back to back State Winery of the Year awards, word tends to get out.